NEW YORK (CNNMoney) -- In the United States, 63,000 tons of nuclear waste, the sum total of all the waste generated by decades of nuclear power, sits right where it was created -- at the power plants themselves. "It's probably the single greatest security vulnerability in the United States," said Kevin Kamps, radioactive waste specialist at Beyond Nuclear, a watchdog group. Kamps and many other industry critics want lawmakers to mandate that most of the waste, known as spent fuel, be stored away from the main reactors in certified steel and concrete casks, then have those casks placed in fortified buildings or earthen bunkers. "But it's fallen on deaf ears in Congress," Kamps said. Currently most of the waste sits close to the reactors in large pools that resemble swimming pools. A smaller amount is kept outside in casks that critics say are poorly guarded. The reason so much waste is being stored at the nuclear power plants themselves is that the government hasn't figured out what to do with it permanently. Storing the waste in this manner was supposed to be a temporary measure until it was permanently buried deep inside Nevada's Yucca mountain. But thanks to a mix of geology and politics, that site was recently deemed unsuitable. The hunt is on for a new long term repository, but finding and building one will likely take decades. The industry and the government say storing the waste at the power plants for decades isn't a problem. "The fuel is safe, in a cask or in a pool," said David McIntyre, a spokesman for the government's Nuclear Regulatory Commission. McIntyre said the government will take a look at waste storage as part of its comprehensive review following the events in Japan, but added that, at this time, "there's no safety reason to move it." Industry critics couldn't disagree more. They say the radioactive spent fuel rods, which rely on circulating water to remain cool, are vulnerable to both natural disaster or terrorist attack. In a natural disaster, a power outage from an earthquake, hurricane, tornado or other event would cause the water pumps to fail. Yes, there are back up generators, but sometimes those fail too, as is the case in Japan. If that happens, it's only a mater of days until the fuel heats up to the point where it boils off the water and then catches fire. 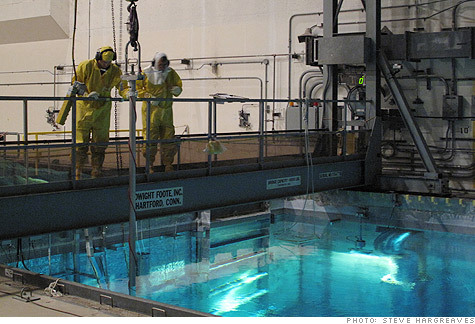 They note that the pools themselves are located outside the reactor's main containment dome. An explosion, like what occurred in Japan, would expose the pools to the open air. It's also possible for terrorists to specifically target the pools. Reactors like the ones in Japan, of which there are 23 in the United States, are particularly vulnerable. The pools in that design are located several stories above ground, making them easy targets for shoulder-fired missiles or airplane attacks. Critics say the concrete and steel around the pools are designed to prevent radiation leaks, not to stop a missile. "It's hard to understand why the Nuclear Regulatory Commission has not mandated a more rapid transfer of spent fuel to dry casks," California's Democrat senator, Dianne Feinstein, said at an appropriations subcommittee hearing Wednesday. Kamps said the reason is cost -- that it would cost up to $100 million per reactor to move the fuel from the pools to reinforced dry cask storage, a cost the companies that run the plants do not want to bear. The industry said cost has nothing to do with it. "We're ready to cooperate with the NRC and others on all aspects of our operations," said Bryant Kinney, a spokesman for the Nuclear Energy Institute, an industry association. Despite their willingness to cooperate on any additional safety measures the government may require, the industry feels the fuel is safe right were it is. Kinney pointed to a 2002 study from the Electric Power Research Institute, an independent research organization, saying that the plants would withstand an impact from a commercial airliner. He said that includes the spent fuel pools. Plus, moving the fuel from the pool to a cask is a dangerous operation in and of itself. There's no need to take that risk if, eventually, it will all be moved to permanent storage anyway. The NRC said that since Sept 11, 2001, the industry has become much more prepared to deal with unexpected losses of power or attacks on its facilities. Preparations include pre-positioning generators, water and other equipment near a plant, but not close enough that they would be damaged in an attack or natural disaster. As for the risks of a worst-case scenario, the NRC wouldn't speculate on just how large the contamination area might be, only to say that a fire in a spent fuel pool is "extremely unlikely." Some experts have said the fallout zone would be smaller than a 50-mile radius. Others have said three times the size of New Jersey. Everyone does agree on one thing: It would be a terrible situation.